¨ To encourage and promote meaningful working relationships between the various building inspection authorities within the region. ¨ To promote a mutual understanding of codes and their enforcement between design professionals, contractors and enforcement personnel. ¨ To provide a continuing review and analysis of construction code oriented matters. ¨ To recommend code changes consistent with the policies of the ICC and BOAF. ¨ To promote continuing education among members. ¨ To conscientiously endeavor to implement the recommendations of the ICC and BOAF. ¨ To actively cooperate with other regional chapters. 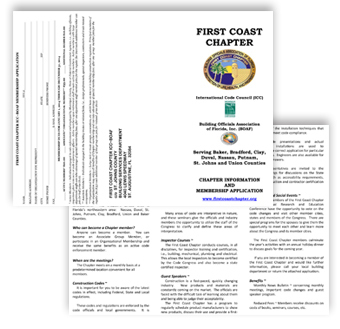 ¨ To promote the objectives of the International Code Council and the Building Officials Association of Florida, Inc.